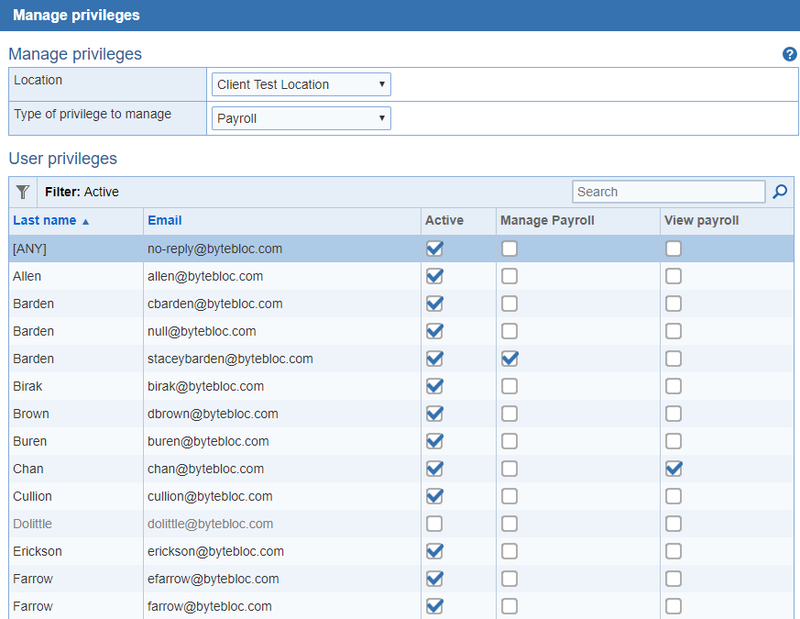 Manage privileges for all users. 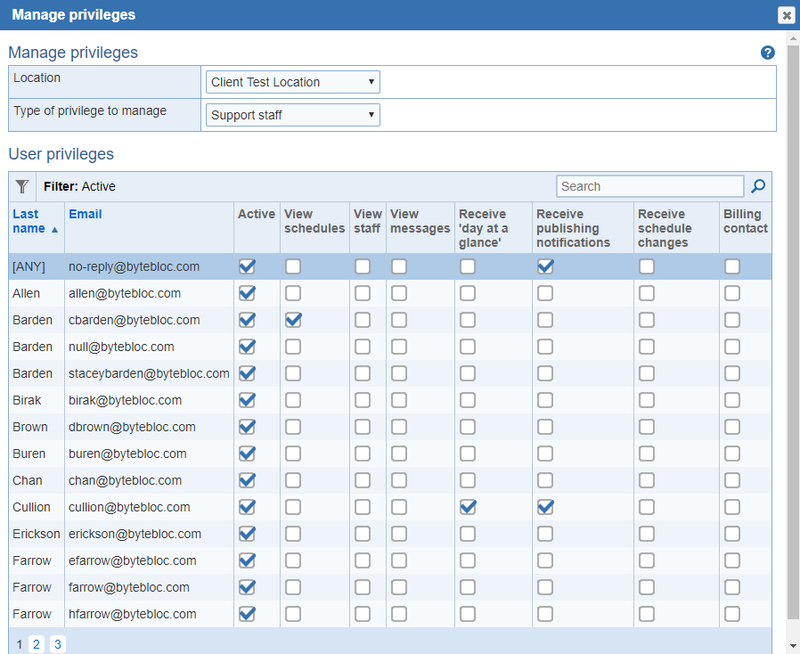 Location: Privileges can be managed across locations in the manage privilege screen. Administrator: User who has access to maintain, manage, modify settings and schedules. Payroll: User who can only view the master schedule and payroll summaries. 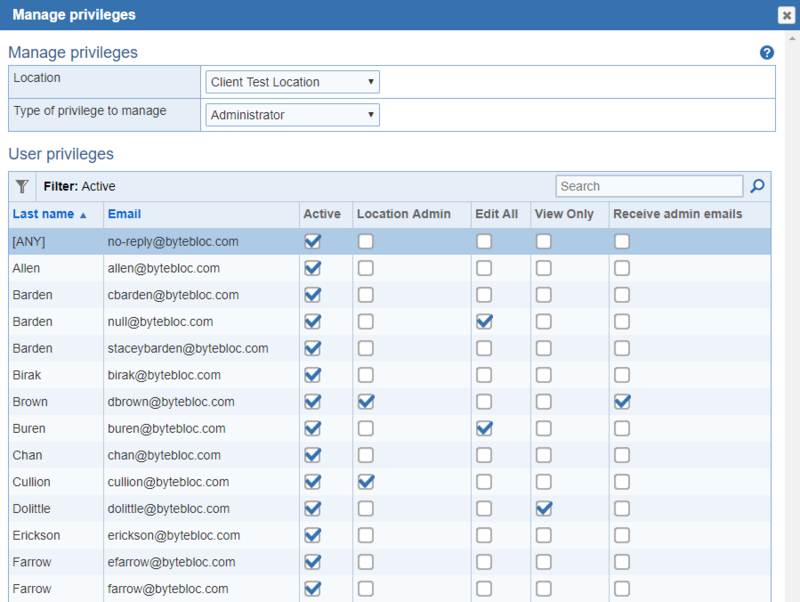 Provider: Can edit/view their schedule, view contact information, and edit their settings. Support staff: Can view contact information, reports, schedules, and download. Location Admin: Full administrative privileges within the location. Access to maintain end users, privileges, schedules, scheduler portal, shifts, shift settings, admin settings, user settings, manage category reporting, and payroll. Edit All: Access to edit individual, master, request schedules, approve/deny 'Swap Meet' shifts, and 'My proposals' shifts within locations. 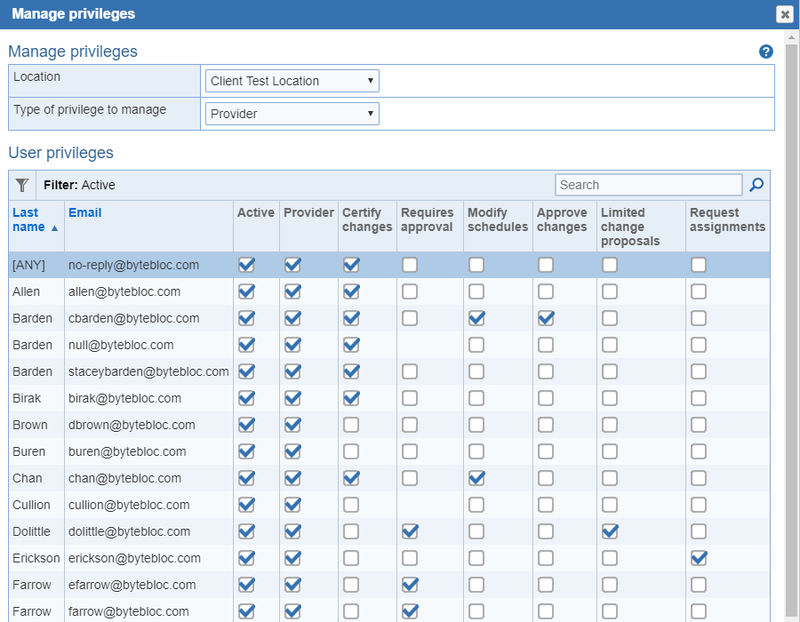 Ability to change passwords for providers and download reports. View Only: Can only view schedules within master and provider portals and download reports and schedules. Receive admin emails: Receive all schedule change email notifications, 'Draft', 'Requests', 'As-scheduled' publications, Future off Requests', and 'Swap Meet' shifts. Provider: Verifies if this end user is a provider or not. Certify Changes: Providers who are allowed to 'Certify changes' can make changes to the schedule by certifying that they have spoken to all involved providers and all have approved the change. Requires approval: If any provider involved in a schedule change is selected as requiring the schedule administrator's approval to make all schedule changes, you (the schedule administrator) will need to approve the proposed schedule change before it is changed in the schedule. Modify schedules: Providers can make changes to other providers' schedules (including trades and splits), change availability, and confirm worked hours for other providers when needed. All schedule changes are tracked in 'Schedule Changes' screen. Approve changes: Providers with the ability to approve schedule changes. View schedule: View only access to current, previous, and future schedules, provider portal, hours, and shifts reports. View staff: View only access to staff information, 'Recall Providers', and the current schedule period. View message: Access to create/send/view emails, memos, files, and text messages. Receive 'day at a glance': Obtain an email notification on a daily basis displaying the scheduled shifts for the day. Click the 'Close' button to update your end users privileges. A filtering function can be used to search for 'Active', 'Inactive' end users, and Provider groups. Once; you click the 'Apply' button it will display the selection you chose. If you are searching for an inactive provider make sure to adjust the filter in left hand corner before you do the search.